Reflecting on our many wonderful accomplishments thus far, we look forward to what still awaits us in the next chapter of our story. From the first parish Masses celebrated in the homes of founding parishioners, to the storefront church and the converted walnut processing factory, and on to the warm and welcoming Romanesque-style church building on the corner of Gateway Boulevard and Colby Avenue, our parish family has been truly blessed. In reflecting on these, we look forward to the many blessings yet to come. 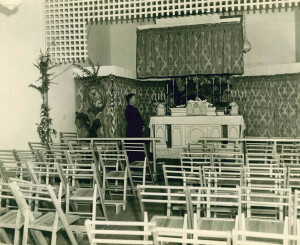 St. Joan of Arc Parish had its humble beginnings on the Westside of Los Angeles as a “store front” church on Pico Boulevard under the pastorship of Reverend Eugene MacSweeny. 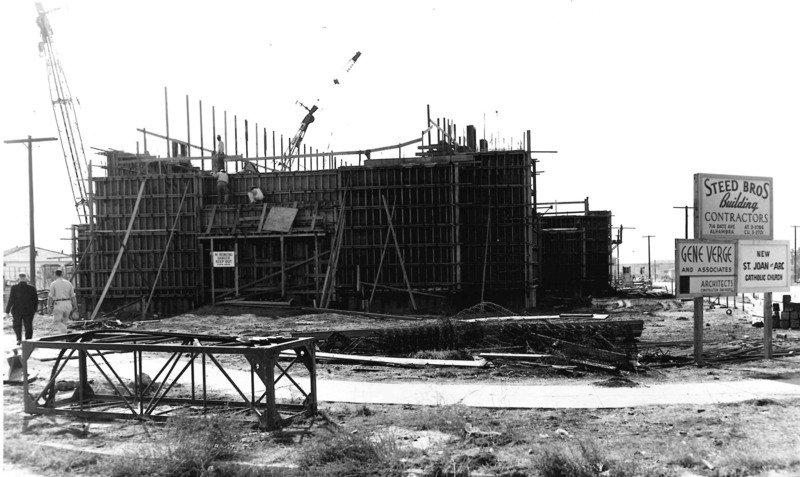 His vision, energy and community-building talents laid the foundations for the parish campus as we know it today. Starting in July of 1943, he gathered parishioners, found and purchased the properties, planned and oversaw the building of the parish elementary school, which opened in September of 1947, built a convent for the Sisters of Notre Dame who staffed the school, and remodeled the walnut factory that had served as the parish church into the present day Parish Hall. In August of 1953. Monsignor MacSweeny laid the cornerstone of the present day church building. 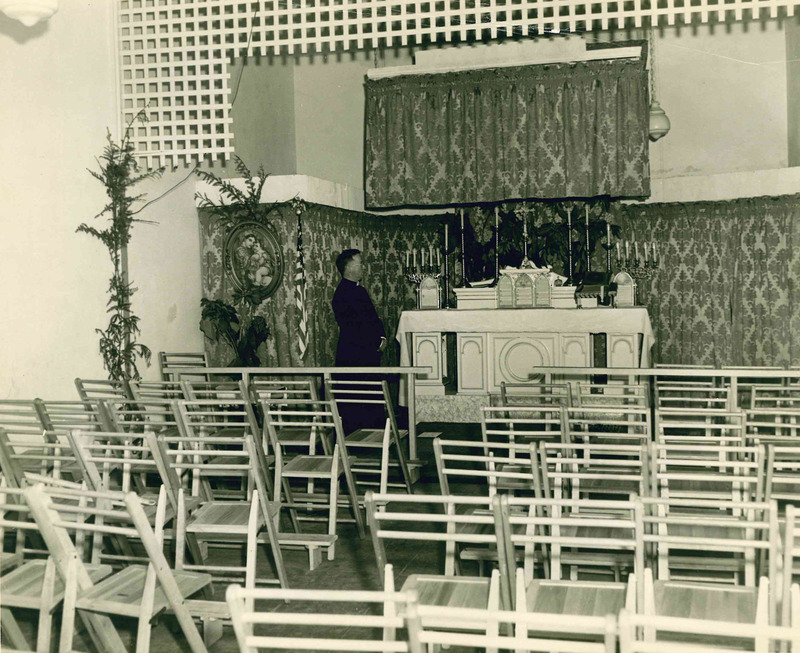 The first Mass was celebrated in the new church on June 13, 1954. It remains the hub of our parish life. The parish community hosted many parish organizations and social clubs, blossoming from that first handful of parishioners into a present day roster of more than 1,400 families. Monsignor Robert F. Condon, appointed Administrator in 1974, officially became our second pastor in April 1975 at Msgr. MacSweeny’s passing. Msgr. Condon’s pastorship saw many changes. He instituted the first permanently scheduled Spanish-language Mass, a formal invitation to the Spanish-speaking community to become an integral part of parish life through religious and cultural celebrations. His other innovations included Saturday religious education classes, social outreach through the founding of the 50+ Club and the Guadalupanas Association, and the postings of newly ordained priests as associate pastors with Fr. Condon as their mentor. The parish school continued to flourish. Various social events more closely tied parishioners to their parish family. Msgr. Condon shepherded the parish until poor health forced his retirement in May of 1983. At Msgr. Condon’s retirement, Reverend John F. Cunningham became our third pastor and continued to build on the foundations previously laid by Msgr. MacSweeny and Msgr. Condon. A number of priests in residence, some heading archdiocesan ministries and several from Africa completing their post-graduate studies, shared their time and talents at St. Joan’s. In 1993, the parish community began a year-long celebration of its Golden Jubilee culminating in July of 1994 with a special Mass celebrated by Cardinal Roger Mahony, together with Fr. Cunningham. A long procession of past and present associate pastors, school teachers, alumni and members of our extended parish family filled the church to standing-room-only. During this time there was a “changing of the guard,” as the Sisters of Notre Dame left the school and convent and the Sisters of St. Joseph of Carondelet moved in. Shortly before his retirement in December of 1995, Fr. Cunningham hired Sr. Virginia Stehly, CSJ to the parish staff as Pastoral Associate. January 1996 saw the dawning of a new era at St. Joan’s with the arrival of Reverend James H. Barnes, Jr. as our fourth pastor. Under Fr. Jim’s direction and Sr. Virginia’s encouragement, the parish took on a spirit of revival and renewal, not only of the physical plant but also the parish community through the implementation of the first of our 5-year Parish Plans and participation in Renew 2000. Emphasis was placed on hospitality and welcome, acknowledging room for a wide range of faith experiences and demographics. In the summer of 1997, the parish hall once again served as the site for liturgical celebrations while the church building underwent major renovations from the roof down to the removal of the Communion rail. October of 1997 marked the completion of the first phase of the building renovations, followed by creating more office space in the rectory, major improvements in the school and school yard, and the remodeling of the apartment building into a Pastoral Center, with the Youth Room on the ground floor and several more meeting rooms upstairs for many ministries and organizations. Changing demographics on the Westside of Los Angeles presented a challenge to the parish school. In the hope of increasing school enrollment, the idea of a preschool came to be. Under the leadership of Diane Conrad, school principal, and the great generosity of many parishioners, the St. Joan of Arc Nelson Family Preschool was built and opened in December of 2006. Sadly, the demographics continued to change and both the preschool and elementary school were closed because of under-enrollment at the end of the school year in 2009. The Sisters of St. Joseph moved out of the convent building and the Misioneras Guadalupanas del Espíritu Santo took up residence in 2013. Fr. Jim’s well-deserved retirement at the end of June, after more than 18 years of caring stewardship as Pastor at St. Joan’s, concludes another chapter of our parish history. In July 2014, a new chapter in our story began when St Joan’s welcomed Reverend Joseph Quan Nguyen as our Parish Administrator and installed on July 10, 2016 as our fifth Pastor by the Most Reverend Edward Wm. Clark, D.D., S.T.D., auxiliary Bishop of the Archdiocese of Los Angeles. The Spirit continues to breathe upon our parish family, strengthening and uniting us as we continue to build the Kingdom of God here in the Westside of Los Angeles.